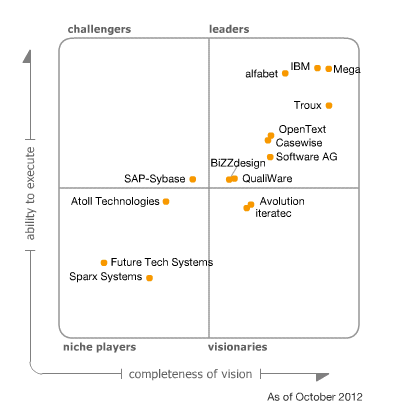 Gartner has released yet another great resource for Enterprise Architects with their EA Tools Magic Quadrant. Overall, it’s been a "light" year as far as the degree of change in this marketplace is concerned. During the past year, some EA tool vendors have begun, or continue, to further reposition their products as broader enterprise business planning tools, in addition to being classical EA tools. This drives two primary vendor changes: in product marketing and in product output targeted at effective presentation to business leaders. This repositioning is helping vendors increase the interest and engagement of business leaders, and overcome skepticism about the term "enterprise architecture." These vendors report that they are working to expand their addressable market and increase revenue. For users, this strengthens vendor viability by expanding their business in this otherwise smaller, niche market. At the same time, it drives improvement in features that are important for use by business stakeholders. Although these vendors still support EA concepts, principles and best practices, this repositioning may help to rebrand IT-centric architecture efforts in a more business-relevant manner. Of course, renaming and repositioning EA will not resolve challenges of governance, business strategy, measurement, collaboration and communications. Clients need to evaluate a vendor based on its real abilities and capabilities to support their holistic EA tool needs — not based purely on market repositioning. These tools are ideally suitable for the EA and they don’t cost that much! Shame to spend so much money and time to implement financial systems when an abacus exists.